Sir Michael will also tour the UK next year in brand new live show London, October 29th: Sir Michael Parkinson releases a personally curated 3CD collection, Our Kind of Music: The Great American Songbook. Alongside his interviewing and writing, Sir Michael Parkinson has spent much of his career promoting the appreciation of the music of the Great American Songbook and encouraging those of the new generation who are fighting to keep that flame alive. In the process he has developed an encyclopaedic knowledge of that genre. This collection features artists ranging from the legendary singers Ella Fitzgerald, Tony Bennett and Frank Sinatra to modern masters of the genre Diana Krall and Jamie Cullum. It also features an exclusive new single by British artist Joe Stilgoe, ‘Our Kind of Music’. 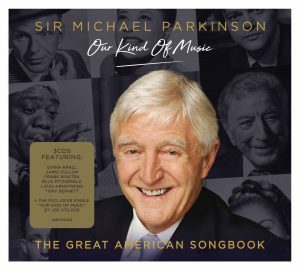 This fantastic 3CD album, released on November 24th, will be supported by Sir Michael Parkinson touring the UK in a new live theatrical show next year. In conversation with his long term producer, collaborator and son Mike, using clips from his classic and extensive archive and featuring live performances by Joe Stilgoe, the tour will take a fascinating, entertaining and informative journey to the musical heart of Sir Michael Parkinson. Michael Parkinson began his career as a journalist on local papers and as a features writer for the Daily Express and Manchester Guardian. His first foray into TV came when he joined Granada Television in 1962 as a producer before appearing in front of the camera. He returned to Granada to write and present Cinema which introduced him to a significant TV audience before moving to the BBC to join the 24 Hours team. His talk show Parkinson was launched in 1971 and ran until 1982. He has also had a successful career on radio. In 1996 Michael launched a Sunday morning show on Radio 2 – which ran for 12 years. In 1998, he was separately honoured for his work in journalism, radio and television. The same year saw a new series of Parkinson start on BBC ONE lasting until 2003 and winning many awards including a BAFTA in 1999. In 2004, he successfully transferred Parkinson to ITV until his retirement from the show in 2007. Parkinson was voted in the top ten in a British Film Institute poll of the Best Television Programmes Of All Time. The show ran for over 800 episodes and Michael interviewed more than 2,000 of the world’s most famous people during its run. He was awarded a CBE in June 2000 and a knighthood for services to broadcasting in the 2008 New Year’s honours list. He was installed as Chancellor of Nottingham Trent University in 2008, a post he held until 2014, started his own Production Company and his autobiography, Parky, topped the Best Sellers charts in 2008/2009. 2009 saw Michael embark on a tour entitled Parky: The One Man Show in which he told of his life and career to packedout venues in Australia and New Zealand. 2010 saw the launch of two further projects, headed by Michael and Parkinson Productions – the release of another book – Parky’s People – and a Best Of Parkinson DVD. In March 2011 Michael and Sir David Frost collaborated in Sydney to produce two programmes for Channel 9 Australia – Frost Over Parkinson and Parkinson: The Frost Interviews. In 2011 Michael recorded a series of radio shows for BBC Radio 2 entitled My Favourite Things. 2012 saw the launch of a new series for Sky Arts – Parkinson : Masterclass and another DVD – Parky’s Picks. In 2013 Michael recorded the second series of Parkinson : Masterclass for Sky Arts and a further series of My Favourite Things for BBC Radio 2. During 2014 Michael recorded a series for Waitrose TV, an interview with Ian Thorpe for Australia’s Channel 10 television network and a radio series for Australia’s 2CH and Magic radio stations called My Kind of Music. 2015 saw the recording of three programmes for Australia’s Network 10 – Parkinson’s Australians, Billy Connolly – The Parkinson Interviews and Muhammad Ali – The Parkinson Interviews. 2016 saw the publication of Ali: A Memoir, a summation of the great man’s life and career based around the four definitive interviews Michael had with The Greatest.